Her Excellency, President Chandrika Kumaratunga of Sri Lanka studied for her Law Degree at Aquinas University in Colombo , and then pursued her studies at the University of Paris from which she received her degree in Political Science and a Diploma in Group Leadership. 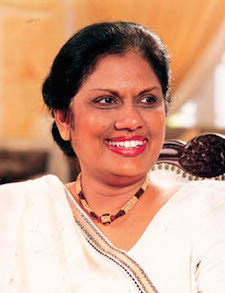 She studied Political Journalism at the Le Monde in France , and her Ph.D. studies in Development Economics were curtailed when her mother, the world’s first woman Prime Minister, Sirimavo Bandaranaike, requested her to return home to serve her country by launching a national reform and development program. Born the daughter of a prestigious family, she saw her father become Prime Minister and later be assassinated. Her husband was also assassinated. She has seen many challenges of civil war. Now, Her Excellency President Chandrika Kumaratunga faces the aftermath of the Tsumani tragedy, with great loss of life, and 800,000 Sri Lankans displaced from their homes. We award Her Excellency today as an Outstanding Woman in Buddhism, and encourage her support for peaceful conflict resolution in Sri Lanka.